The notched screen a la iPhone X is the latest trend (don't call it a fad) in the Android world, one which has been picking up steam disturbingly fast. 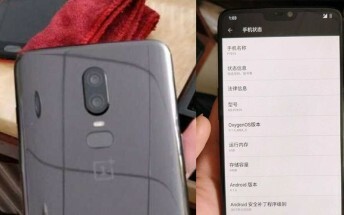 And according to a new leak, the upcoming OnePlus 6 will go with the flow and come with a notch of its own. This development was first revealed in a leaked live image from last month, which also tells us that it will be incredibly hard to tell the OnePlus 6 and the Oppo R15 apart. The shared design isn't surprising, given past antics and the fact that both Oppo and OnePlus are owned by BBK Electronics. Anyway, the OnePlus 6 is to have a 19:9 aspect ratio display, taller than the 18:9 panel of its predecessor, the 5T. That said, what's left when you exclude the space to the left and right of the notch may actually have 18:9 aspect ratio. A prototype OnePlus 6 (with the model number A6000) managed to score 276,510 in the AnTuTu benchmark, as evidenced by the screenshots below, besting the also not announced yet Xiaomi Mi Mix 2s, the previous champion. The OnePlus 6 will arrive in June with the Snapdragon 845 at the helm, that much has already been confirmed by the company's CEO. According to previous rumors, it shall have a glass back and dual rear camera too, basically adhering to all the prevailing trends in the mobile space at the moment.